by Stephen Qualtrough of Liverpool 8th July 2012. My brother Philip Qualtrough, sister Diane Qualtrough and myself were brought up on Breck Road in Liverpool, part of the Everton District. When I started school at five years old, my Grandfather John Qualtrough was already two years deceased, having never recovered from a hospital operation. My Grandmother Alice Qualtrough (nee Howarth) sat alone in an armchair in the front room or 'parlor' as we called it. My Grandfather’s shed stood forlornly in the back yard. It was where he used to make furniture. My mother was still hoping to get enough 'points' so that we could move away to a house of our own. We had lived in the 'back kitchen' which was the largest room, during the day; and I used to visit Grandma who lived in the parlor. She would read me the cartoon strip out of the ‘Daily Sketch’ about Sooty (a bear who had a large magic wand and cast spells. On Saturday I would pop in and ask Grandma if she wanted anything from Peagrams Grocery Store around the corner. One regular item was a loaf of 'Nimble' brand meat for slimmers. This was later made famous by a TV ad. It featured a beautiful girl wearing a flowing dress in a hot air balloon whilst the song ‘I can’t let Maggie Go’ played on the soundtrack. Grandma wasn’t interested in slimming. The light texture of the slices was what attracted her. I was quite partial to it myself. Auntie Edna Jones visited every day. She lived in Varther Street near the Anfield football ground. She made us all laugh with her funny comments and stories about the events of the day. We all knew Christmas was nearly upon us when Auntie Ag and Auntie Lil paid us a visit. They were Grandma’s sisters. When they were visiting, Grandma would bring down wine glasses from a large cupboard in the parlor. These were the only times that Grandma took a little drink. Saturday afternoons Philip and I met up with cousin Graham and we would queue up for the children’s matinee (held at 2pm) at the Royal Cinema. The cinema was about three streets down and across the zebra crossing. They let us in through a side door so as not to mess up the foyer. They had miserable expressions, and sometimes muttered "I hate Saturday afternoons". We had worked out that the best place to site was in the front row next to the speakers. In this manner, budding film buffs that we were, we could actually hear the dialogue as the noisy Everton kids stormed around us. It was worth the stiff necks afterwards. The usherette – before she was driven half crazy - gave us odd looks each week. From this vantage point we would enjoy such 30s and 40s classics as Buster Crabbe playing Flash Gordon, or the very first film adaptation of Batman. This one was a serial and played an episode a week. At the climax of one episode Robin turned to the camera and declared "Batman’s dead". We had long faces for a week. We did everything but wear black armbands. The next week when we returned to our front row seats, Robin had made a mistake. Batman got up again very much alive. All that mourning for nothing! On each Sunday the trio of us would go to the Richmond Baptist Church, at the other end of the block from the Royal Cinema. The minister would give us a homily each week. His name was Mr Hamilton and he would often make witty comments that made us all laugh. It was nice to have a bit of a giggle over something harmless in a religious meeting. It was not at all like the more formal religious assemblies in school. I liked the Baptist Church. One summer we all took the boat over to the Isle of Man and stayed for a week in a cottage in Laxey. 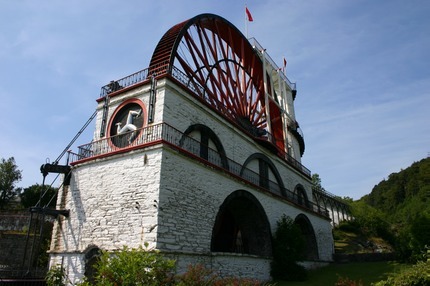 One day my father, John Qualtrough, said we were going, just the lads to see the Laxey Wheel. When we got there I was disappointed. I thought we were going for a ride on a fairground Ferris wheel, but I said nothing to father. Nowadays I am glad to have seen this iconic sight, the largest waterwheel in the world. We also went to visit our Great-Aunt Elizabeth who everyone called ‘Lizzie’. She lived in a cottage on the Isle of Man, but had previously lived in Fowler Street in Liverpool as a girl. In the summer of 1963, mother got the house she wanted on the new estate in Halewood, just across the Liverpool border. My Grandmother gave up No 4 Hunt Street and went to live with Auntie Edna, her husband George and the boys Graham and Keith. The Beatles had just entered the UK charts again with their third big hit and we were all pleased to learn that our new house was not far away from where George Harrison lived in Macketts Lane. It was a new start for us, but we would never forget No 4 Hunt Street. Both Hunt Street and Fowler Street have now been redeveloped leaving only the shop-front section of the roads as they were. The nameplates are still up to denote Hunt St and Fowler St, but once past the first alley way that is as far as it goes. Faraday St towards Breckfield Road end is still as was, as is Grasmore St and the Richmond Baptist Church is still the same, but a different denomination has taken it over.